I was curious if anyone out there has the production numbers on 1964 Buick Electra 4 speed Buicks. In all my Buick travels I've only seen two, and I heard of another but it was crushed many years ago in California. Out of the two I do know of, one may be for sale soon and I'm curious as to how many of these cars were actually made. The owner has the original build sheet and it's a true 4 speed manual shift car. Any help out there ? I truly do not believe they exist or ever existed. I would want to see the build sheet or window sticker. According to The Standard Catalog of Buick, only automatics were available in series 4800. That isn't to say they couldn't be special ordered. Oh, I'm a Ford guy also and someone told me they never made a 63 427 Galaxie with a tri-power ( only single or dual 4's ), well, a guy that had one special ordered still has that car in Denver Colorado with build sheet. No book ever said they made that drivetrain setup. But, he has window sticker, build sheet and speical order ticket to prove it. Anyway, if anyone has any good data I would appreciate it. With that being said, I have the daily production sheets from the Sloan for every 64 Electra made, and there is no series 4800 with the 4-speed. 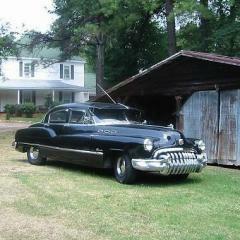 That is not to say one or two were not made, but they were not documented by Buick. Like I have told you in the past, look on the Fisher body tag, and see if it is stamped 2L in the ACC part. If it is, and it is the correct tag for the Electra, it was built as a 4-speed at the Fisher body plant. If it does not have 2L, then it was not built as a 4-speed, though it is possible someone high up at GM or someone with large strings to pull had one built but not documented. If you want concrete proof or possible production numbers, you'll have to talk to someone that worked for Buick in Flint (that's where all the 4-speeds were made and no other plant) as that information does not exist from the documents available to deciper these cars. The trans will be VIN stamped, look on the top of the main case at the front right behind where the bellhousing is mounted. It will match the VIN on the motor and the VIN on the door pillar. The first three digits of the VIN must be 8K1. No other plants built the stick shift full size cars. The true build sheet from the factory, NOT the sales invoice. I am not going to argue whether they built one or not, but provided here are some methods to check for authenticity. As far as how many, the indicators say zero, but you never know what may have left the factory with undocumented equipment. Let's hope this is one of them, it'd be a very cool car. NOTE - I just contacted a good friend with some obscure 1964 Buick production info, so hopefully he can add some interesting facts. Wow, a '64 E with a manual shift, that would be wild! I bought a '68 Skylark from a guy, who's father worked at Buick, said that he brought home, a '64 or '65 Riv with a manual shift, once, they never made it, guess I should ask Dennis Manner about that too! Thanks for all the detail. I remember telling the guy on the phone about that Galaxie... They never never never did make a tri-power 427 car, and I ate crow when he produced the build sheet. Still to this day it was the only one I've ever seen. Ford guys still think I'm full of it, but I held the sheet in my hand and looked at all the VINs and paperwork. The crazy thing about that car is it was an R coded car, but it said Special order on the form from the dealer for the 3x2 setup. On the Buick, you are the almighty intel guy on 4 speeds these days for sure. I know that was early on about the 425 example, and I'm with you completely on never say never. My gut says they probably made a handful, and the guy with this car has many 4 speed cars and has been around doing this since I was born. He's only seen two, and he bought both. I'm also taking the guys word for it on the one in Cali, but the other two I've seen. The one in Cali was also looked over by a guy into the rarest of the rare Pontiacs and he knows his stuff. He claims he had ran all the #'s and it was legit. Well, I hope it pans out. The car is not cheap, so trust me that I'll use a fine tooth comb. Burk, I hope you are right. That would be quiet a find. Please keep is informed. That is why I posed my comment the way I did. I do not believe it and would need proof. I certainly didn't say they don't exist and would love to see one, as opposed to being proven correct. Those were heady days when if you had the connections, money, motivation - you could get what amounted to a COPO car. I worked at Buick engine plant from 1990 to 1995 and heard stories about 1964 Rivieras with 4-speeds but never an Electra. Another clue to being from factory might be how the whole for the shifter was cut out. An Electra would be easier to make than a Riv because it has same front floor and shifter as a Wildcat that got 4 speed. The Riviera stories stated that the shifter arm was welded up to get it to the correct angle since those cars were never meant to have stick shift. If you ever worked for GM you would know that if it was physically possible to build something it was probably built, whether on purpose or by accident and with engineering approval or not. Anyone who argues differently has never been on the factory floor. I have thought about putting 4 speed in my 70 Wildcat convertible with factory buckets out of a hardtop, but putting a 4 speed in my 64 Electra 4-door sounds like even more fun. Would go well with my dual quad and 3.42 posi out of 65 GS Riv. I'll never forget being at GS Nationals in late 80's when a Bowling Green local pulled up to show in mall parking lot with light blue 4 door Electra with vinyl top and what he swore was factory dual quads. Does the Electra 4 speed have bucket seats? That could be a clue, too, to see if the bucket seat attachments look like they came from factory. Would stock Wildcat shifter hit the bench seat? You seemed firey for someone that doesn't know 100% that they didn't make one. I'm 100% with Matt, never say never. I started this posting looking for accurate answers. Looking for help from the Buick gurus. I told Matt about this car a few years ago when the current owner found it in Cali. He's super picky on documentation like Matt is. I could type a book on how odd this guy is, but won't bother boring you all to death. The story on this car was the first owner wanted the Electra, but had a boat and wanted a manual shift to pull it around Cali. As far as the seat situation, the one he has is a bench seat car with console plate on the floor. It looks just like the one I've seen in Matt's 63 Lesabre 4 speed car I found for him in Colorado when I lived there. I'm not sure if it's 100% like that one. But it's a flat chrome shifter plate on the floor with the buick tri-shield emblem on it. I don't know if Matt ever followed up with the Pontiac guy in Cali I gave him the number to, but he had verified the car that got crushed in San Diego, was a bucket seat car. So one of each existed. The bench seat car I saw "live" was legit, but the bucket seat car I've never seen 'live' I took the guys word for it. He told me it was original and numbers matching. I met this guy looking for 61-64 4 speed Bonnevilles.... searching for myself and Matt. So in my small world I only know the bench seat car is factory built, but can't give any data on the bucket seat car. That non-crushed car is over in Sweden now, so no chance on getting my eyes on it without a plane trip. Bench seat car is still here in the US.